Comedy Hypnotist Hypnosis Show at UCF Orlando with Hypnotist Richard Barker took place in the CFE Arena on the campus. This show is in it’s 5th year and Richard loves coming to perform for the students who are fundraising for the Make a wish foundation and miracle kids network The show is in support of over 1000 students who get together every year to raise money and awareness, it is truly a great cause. Richard Barker is a world-renowned professional comedy hypnotist performing hypnosis shows across the world as well as other attributes such as, media source, television personality, author and keynote speaker. He has spent the last 20 years entertaining audiences all over the world with his dazzling hypnosis show in 38 countries. As the Incredible Hypnotist, Richard brings his charm and experience to blow the minds of audiences, media professionals, celebrities and corporate clients. Offstage, Richard has improved the lives of countless clients that needed hypnosis to get over an obstacle, phobia or behavior. Using his Master’s Degree in Education, he is constantly helping others understand the true power of hypnosis. Clinical hypnosis is fascinating for effecting positive change work. So I say the word ‘sleep’, as you can see in the above video and whether you feel as if ‘something’ has happened or not, clearly the same happens to every student. I even slow the video down in parts so you can see the expression. I love performing shows and enjoy seeing the laughter on everyones faces. 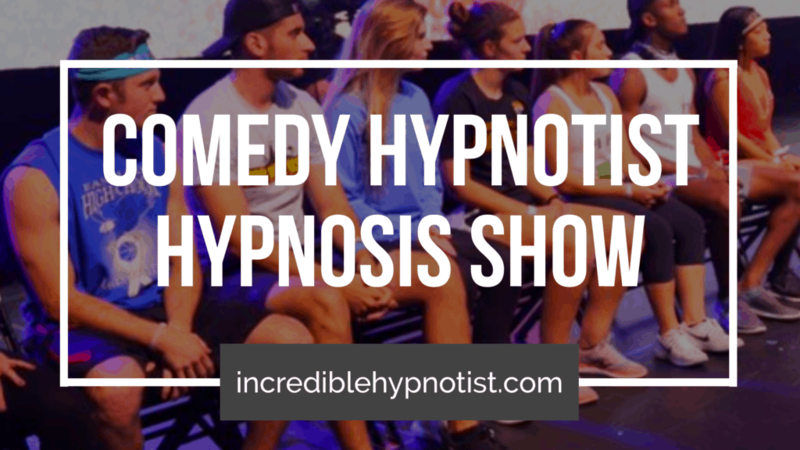 For more about comedy stage hypnosis shows just get in touch with my team. This entry was posted in Blogs and tagged college hypnosis, College Hypnotist, comedy hypnosis show, Comedy Hypnotist, Comedy Stage Hypnotist, hypnosis show, Stage Hypnotist.